With the "Flying Crane" S 60 Sikorsky has opened new operational possibilities for helicopters. The SIKU aircraft F 29a is the hitherto largest aircraft in this series that will commence its operation in the near future. This largest crane is powered by 4 turbines. It has an empty weight of 42,8 tons, and for half an hour it can carry a useful load of 21,5 tons, for two hours a useful load of 17 tons, and for four hours a useful load of 12,5 tons. The aircraft has a removable cabin, which, like any other load can be carried by this helicopter. Over-all length: 35 m  Rotor diameter: 30,5 m  Distance from landing gear leg to landing gear leg: 9,15 m  Max.cruising speed: 55130 km/h, according to load. Manufacturer: Sikorsky Aircraft, Stratford, Connecticut USA. Mit dem " Fliegenden Kran" S 60 hat Sikorsky eine Ent wicklung für neue Einsatzmöglichkeiten begonnen. Das SIKU-Modell F 29a zeigt das bisher vorgesehene größte Modell dieser Entwicklungsreihe, das demnächst in den Einsatz kommt. Dieser größte Kran wird durch vier Turbinen angetrieben. Er ist in der Lage, außer seinem Eigengewicht von 42,8 t eine Zuladung von 21,5 t für eine halbe Stunde, eine Zuladung von 17 t für zwei Stunden und eine Zuladung von 12,5 t für vier Stunden zu tragen. 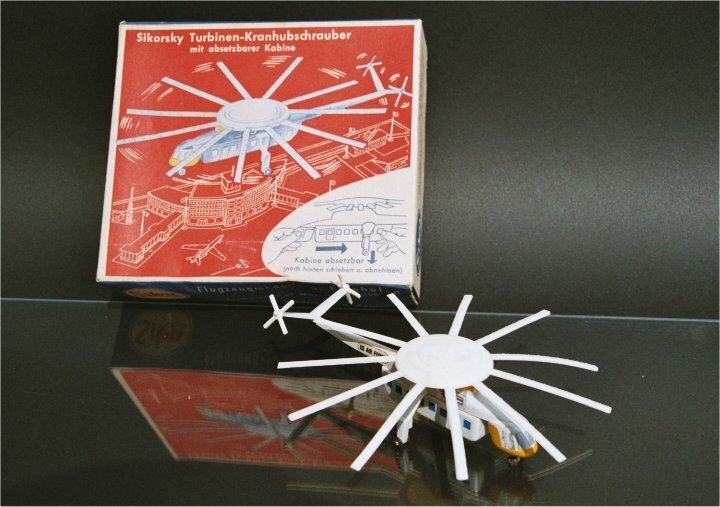 Das Modell zeigt eine abnehmbare Kabine, die dieser Helikopter, wie auch alle anderen Lasten, befördern kann. Gesamtlänge: 35 m"  Rotorkreisdurchmesser: 30,5 m  Breite zwischen den Fahrgestellen: 9,15 m  Höchstgeschwindigkeit: 55130 km/h, je nach Last. 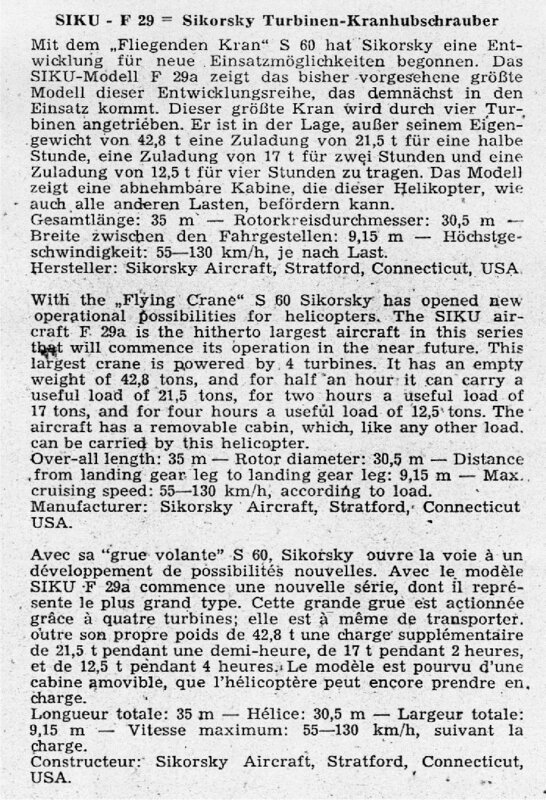 Siku does not mention the Sikorsky S-64 Skycrane around 100 of which have been in service. The project drawings show that oversize rotorhead and the double tail rotors from the SIKU model. (quotes from this article in German language here ). 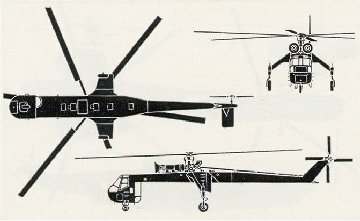 The Skycrane crane-type helicopter has been developed primarily tomeet the requirements of a specification prepared by the GermanDefence Ministry, and the first prototype flew for the first time on May 9, 1962, the second and third prototypes being delivered to Germany for evaluation by the Federal German armed forces in co-operation with Weser Flugzeugbau. Six Skycranes have also been purchased for evaluation by the U.S. Army as YCH-54As. Equipped with interchangeable pods, the Skycrane can be used for mine-sweeping, anti-submarine warfare, cargo and missile transportation, or as a 60-seat troop transport. The flight deck provides accommodation for up to five crew members, and equipment includes a 15,000-lb. hoist. Attachment points on the fuselage and undercarriage lfacilitadte securing of bulky loads. 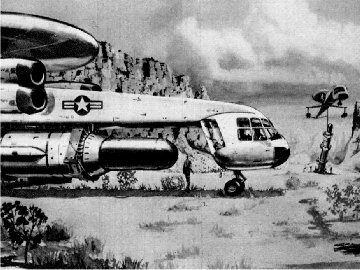 On April 29, 1965 a YCH-54A lifted eighty-seven combat-equipped troops in a detachable van beneath the fuselage. Links und für alle Inhalte der Seiten, zu denen die bei uns sichtbaren Banner, Buttons und Links führen.